Cut roads: Townsville City Council labourers have been working to clear Hervey Range Road, leading west out of Townsville, which was cut by a land slip. HEAVY rains and rising floodwaters have cut off roads and bridges across North Queensland, quenching a long drought and even forcing the opening of the Ross River Dam floodgates for the first time since 2014. A disaster situation was declared by Queensland premier Annastacia Palaszczuk and ordered the closure of Townsville schools and childcare centres for Friday, February 1. However, some Townsville Catholic Education schools outside of the disaster zone remain open, more information can be found at www.tsv.catholic.edu.au. ABC reported at least one man is missing and feared lost in the floodwaters as emergency services warn people not to take unnecessary risks. The Bureau of Meteorology predicted wet weather will continue through until at least next week. As a result of the floodwaters, The Catholic Leader February 3 edition is unlikely to be delivered to the Townsville and Cairns dioceses due to trucks delivering papers being stuck on the flooded highway south of Giru. Newly-arrived Missionary Congregation of the Blessed Sacrament priest from Kerala, Fr Vinoj Francis, went out west to Winton to celebrate a Requiem Mass last week for a 94-year-old parishioner. While there, Fr Francis joined in with an ecumenical prayer service for rain – Winton has been in severe drought. The woman who organised the parishioner’s funeral called the Townsville diocese, saying in all the time they have been joined together praying for rain, not much had happened – until Fr Francis came along. “Fr Vinoj came and they’ve had rain since,” a Townsville Diocese spokesperson said. 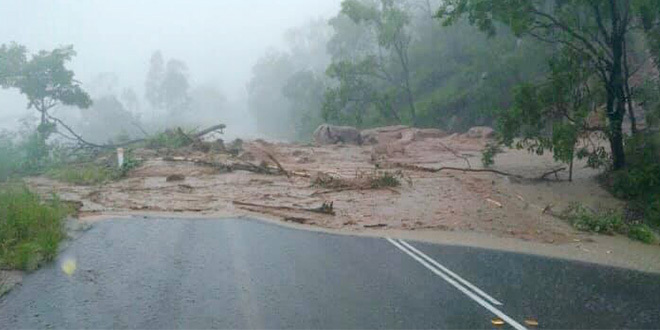 Ms Palaszczuk said more than half a metre of rain was dumped on the region in a 24-hour period. “This record rain comes on top of Cyclone Penny, which had already inundated the Daintree catchment, meaning all that monsoonal rain overflowed river banks more quickly and spread out across low lying areas,” she said.